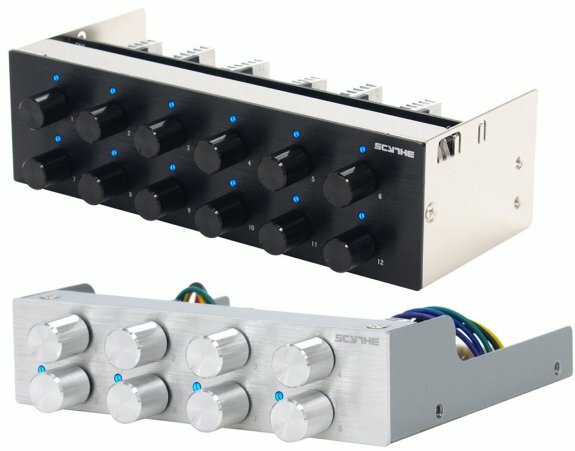 If for some reason you need a fan controller with eight or even twelve channels, you may be interested in Scythe's new Kaze Q8 and Kaze Q12 fan controllers. Japanese cooling expert Scythe is announcing two new Kaze Q Series fan controller. Modern PC Chassis are getting equipped with more fans and allow mounting of additional fans in various sizes, but not every fan is adjusted to low fan speed to assure silent operation. This is where users usually wish to get their hands on to adjust each fan individually to optimum operation volume and speeds. Scythe Kaze Q8 and Kaze Q12 are aiming for exactly these purposes where the core function of controlling fans is the main focus. Kaze Q8 is designed more compact for restricted space limitations inside a PC Case and can be therefore mounted into a common 3.5" bay. Despite the compact size up to 8 fans can be connected and controlled individually. For PC Cases with an vacant 5.25" Bay, Kaze Q12 is the perfect choice with its total of 12 fan channels for maximum utilization. Fan speed is adjusted for both models using voltage regulations for each channel separately with a control range between 5 and 12 volts. As soon as voltage is flowing over one of the channels, the corresponding channel's LED is visualizing this by illuminating in blue color. It's furthermore possible to completely turn of each fan channel if required. Both Kaze Q8 and Kaze Q12 Fan Controllers were design to blend into every PC Chassis front panel. Hence high quality aluminum was used for the Kaze Q front panel which was brushed as well. Users have the choice between a version with silver pr black front panel to match their PC Chassis. Kaze Q8 Fan Controller is available as of today for 16.75 EUR (excl. VAT/TAX) and Kaze Q12 Fan Controller for 23.95 EUR (excl. VAT/TAX).